Finally, a princess design for us women who consider themselves princesses and queens. 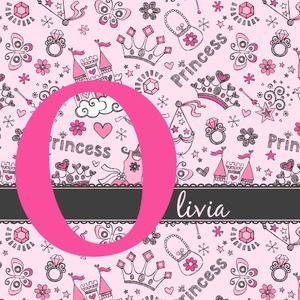 This beautiful pattern is all hand drawn and has items women love such as diamonds, crowns, castles, beautiful gowns, purses, a magic wand, butterflies and flowers. The pattern has been colored in shades of pink, and you can see the pencil lines in a charcoal grey. We chose to personalized the design with our Large Initial and Text on Ribbon Style. We chose the scalloped ribbon, and dark pink and dark grey for our colors. We have many princesses & women in our system - you can choose any one of those and customize to suit your personal style.